As their second phase of interconnected films comes to an end, Marvel sets the cosmic stage with James Gunn’s ambitous space opera Guardians of the Galaxy. Based on the recent comics of the same name, Guardians of the Galaxy follows a group of misfits as they are drawn into a story that seems bigger than all of them forcing them to rise above their differences and work together to stop a galaxy threatening foe. Chris Pratt plays charismatic thief Peter Quill or Starlord -a nickname he gave himself-, a human who was abducted from Earth when he was a young boy in the 80s for reasons that are hinted at but never made clear. Quill is hired to steal a mysterious orb from some ancient ruins which brings him to the attention of ruthless villain Ronan the Accuser (Lee Pace) and puts him on the wrong side of a galaxy wide manhunt. Pratt is very capable in the role of Starlord, managing to juggle comedic and serious dialogue believably and generally coming across as a likeable leading man. Quill is joined by four un easy allies who both help and hinder him as he tries to evade capture. 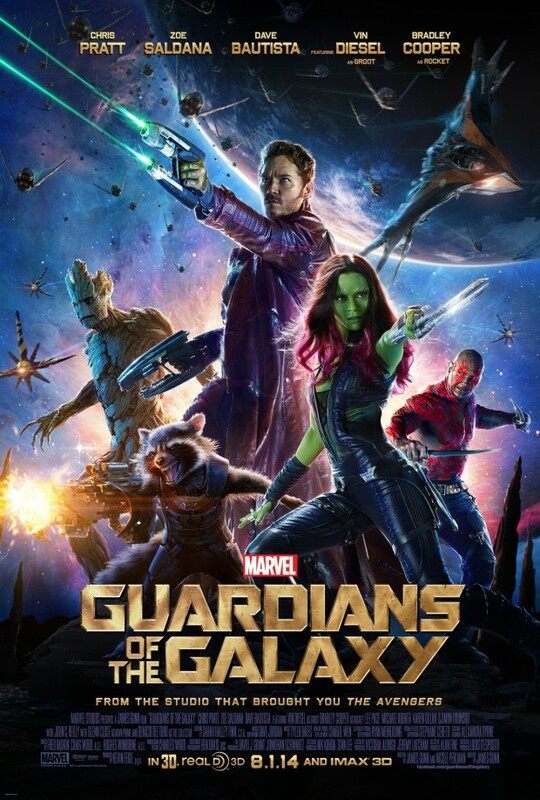 Gamora (Zoe Saldana who adds another franchise to her collection), a green-skinned warrior with ties to larger powers in the universe; Drax (Dave Bautista), a vengeance driven muscle-bound alien; Groot (Vin Diesel), a tree-like alien who can only say “I am Groot” and Rocket (Bradley Cooper), a bizarre wise cracking raccoon-like lab experiment with a propensity for violence and MacGyvering up useful gadgets for a given situation. The team are well cast with Saldana giving a tough yet vulnerable layered performance and Cooper doing an impressive vocal turn that makes him nearly unrecognisable. Bautista was a surprise highlight with his character’s lack of grasp on metaphor providing some of the film’s funniest moments. Diesel’s vocal performance as Groot was surprisingly effective given that he only has three words to work with at any given time. Gunn does a good job of building the universe these characters inhabit with each planet, outpost and space station visited feeling distinct in their visual identity. There is impressive scope to the alien vistas and the scenes never feel like they’re overpowered by the abundance of CGI. There is a surprising abundance of practical effects thrown in with some impressive alien makeup helping make the film look and feel more authentic. Some of the action set pieces are particularly impressive with some impressive hand to hand/weaponed combat and inventive space/sky battles rounding out the mandated action sequences. The production design is incredibly impressive and the film can’t be faulted for the large scale visual aesthetic. Most of the boxes are ticked for the signature Marvel alien species and organisations like the Kree and Nova Corps. The story itself feels somewhat by the numbers in how the team finds themselves thrust into events larger than they are and forced to work together. Comparisons to Star Wars are obvious with the reluctant hero from humble beginnings drawn to greatness on an operatic scale, can’t fault the film for this as it has worked in the past and will continue to work here. The characters feel as eclectic as the Star Wars characters with Quill having a particular Han Soloesque quality to him. Their objectives are simple in that they involve traveling to a place to find something out/do something so that they can go to the next place until they arrive at the set piece finale that finds them recognised as the heroes that they really aren’t. For the most part this works and keeps the film moving at a decent pace but there are plenty of moments where the film slows down for some clunky exposition in an effort to tie the overall plot into the upcoming third phase of Marvel movies. Many of the film’s problems seem to be easily solved by Groot having some kind of ability that was previously unestablished that fits the situation perfectly, after this happened a couple of times I could pretty much predict how a tense situation would be resolved, it feels like a crutch that the film leans on far too often. As with many of the Marvel movies, the villains are pretty thinly written with Lee Pace’s Ronan the Accuser feeling like something of a moustache twirling maniac with shaky motivations. His subordinate, Nebula (Karen Gillan) is great when seen but doesn’t get enough screen time to have anything to work with. Michael Rooker’s Yondu serves as something of a secondary antagonist and is actually the most effective villain. The tone of the film is something that I couldn’t connect with, if the comedy used in the trailers is something that you found funny then you’ll find plenty to laugh at here. There seems to be a constant stream of one liners and quips for every situation but it didn’t really work for me, especially when John C. Reilly’s Nova Corps officer Dey is making wise cracks in situations that someone in his profession should be taking very seriously considering how much is at stake for him personally and professionally. Some of the jokes I found funny but for the most part I was rolling my eyes at the style of humour. This is something that’s very subjective of course and I do think that many will find this hilarious but I was expecting a more serious tone with light hearted elements along the lines of The Avengers. Generally, I enjoyed the film for the characters and the chemistry between the cast as well as the visually impressive sci fi backdrop that feels like a lived in universe that works, again like Star Wars. The story could have been a lot tighter and I really didn’t connect with the tone or style of humour. That being said I think this was a successful experiment for Marvel and it really makes their cinematic universe feel much grander in scale and scope.